Ruffles and Frays is a collaboration of Lectoraat Art & Public Space in Amsterdam, the Dutch Art Institute/ Master Artez in Enschede and the Sandberg Institute. The aim of the project is to develop and produce temporary work in the Zuidas in Amsterdam to contribute diverging positions of the art and the artists to the vision of the area. As the area has the image of a slick and smooth business zone, there is urgent need to show different views, to de-gentrify, to add ruffles and fray to that seemingly smooth image. The Zuidas in Amsterdam is the main hotspot of the global marketplace of business and finance in the Netherlands. The development of the Zuidas started in the 1990s and is projected to be finished in 2030. Currently it is in a state of constant change – in between the vision expressed in the language of the promotional brochures, the emerging steel-and-glass office architecture of the banks and law firms and the daily reality of the employees. How public – or rather private – the open space in between the buildings is, still needs to be established and will be one of our working questions. Since the beginning the Lectoraat Art & Public Space accompanied the development of this area and tried to define the role of art and worked to create space for art in the area. 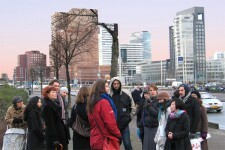 By using the knowledge produced so far by the research group, the project tries to avoid getting stuck in the apparent incongruities of the Zuidas – the contrast between the values and ideas expressed in the vague language of the developers and what a real city might mean – and we will try to get a step further and address the situation as it presents itself in this moment. Ruffles and Frays will partly take place in Amsterdam on the Zuidas, where we will be guests of the Research Group and the Sandberg Institute and partly at the Dutch Art Institute in Enschede. The project will be prepared and accompanied with lectures, visits to the area and visits to artists involved in earlier art projects. The educational trajectory is connected to the event Amsterdam Bright City, a one-day event on June 4, 2008. As a result of the educational trajectory, a selection of works was featured during ‘ Software’ – a one-day programe on art and culture as part of Amsterdam Bright City.